Fans at Wimbledon were today treated to a radiant looking Kate Middleton in attendance at Centre Court. 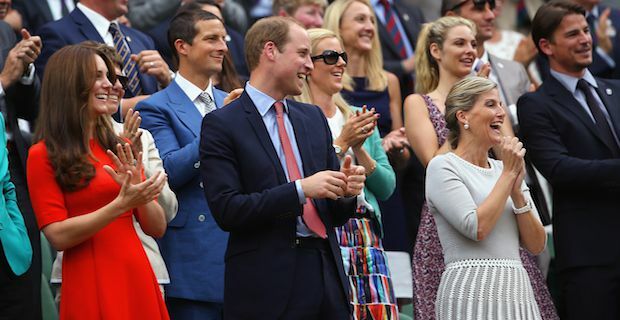 The Duchess of Cambridge took her place in the Royal Box for some Championship tennis alongside husband Prince William. The Duchess certainly stood out in the stands as she was accompanied by a splash of eye-catching colour. Middleton rocked a stunning fitted red dress and could be seen looking quite cheerful as the tennis proceeded, sharing laugh after laugh with William. Kate's beautiful number was nicely complimented by the checkered red tie that Prince William wore with his suit. They watched attentively as Andy Murray successfully took on Vasek Pospisil in his quarter-final match up. The Scot, who is 3rd seed for the tournament, disposed of the Canadian in straight sets 6-4 7-5 6-4 to progress to the semi-final. There he will face a stiff challenge from number 2 seed Roger Federer who is a 7 time Wimbledon Champion.